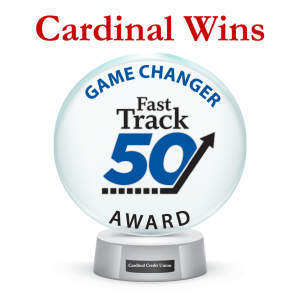 Cardinal wins the Fast Track 50 Game Changer Award! 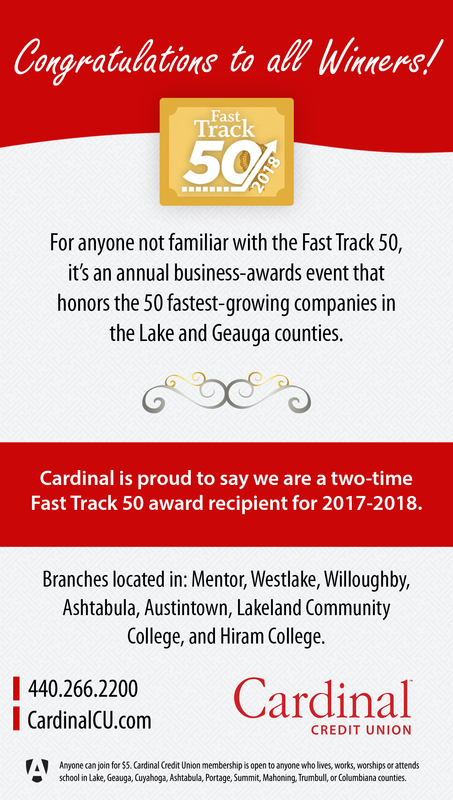 Cardinal Credit Union won the Fast Track 50 Game Changer Award: This award recognizes an individual, new product, company or event that presented a positive reflection of, or generates publicity for, Lake and/or Geauga Counties. When it comes to the results of the annual Lake-Geauga Fast Track 50 business-awards competition, most interested observers look at two sets of numbers. The first deals with which two Fast Track 50 finalists were named as the No. 1 businesses in the event’s Established and Emerging categories. And the second is the order of finish, from 1 to 25, of all Established and Emerging businesses. But an analysis of the list of 2018 Fast Track 50 finalists yields some other interesting numbers that go beyond the rankings that are revealed the night of the annual Fast Track 50 dinner and awards program. This year, the 2018 edition of the Fast Track 50 gala takes place Nov. 7 at LaMalfa Holiday Inn Express Hotel & Suites in Mentor. For anyone not familiar with the Fast Track 50, it’s an annual business-awards event that honors the 50 fastest-growing companies in Lake and Geauga counties. Winners of the 2018 award will be based on a weighted average of 80 percent sales growth and 20 percent employment growth from 2013 through 2017. To be eligible for the award, companies must be located within the two-county region, be organized as a for-profit business, and must have a sales profit for 2013 of at least $225,000. To more fairly compare larger and smaller companies, the Fast Track 50 is divided into Established and Emerging categories. For 2018, Established businesses must report revenue of at least $4 million in 2013, the baseline year for all evaluations. Emerging businesses are required to have 2013 sales of between $225,000 and $4 million. There are 25 businesses on each list. Recently, The News-Herald published the list of 2018 Fast Track 50 finalists in alphabetical order, as a prelude to the Nov. 7 awards presentation. A review of that roster shows there are five first-time Fast Track 50 winners for 2018. Those businesses are Chick-fil-A of Willoughby; Consolidated Precision Products of Eastlake; Essentialware — Global of Willoughby; Millstone Management Group of Chester Township; and ServiceMaster by Disaster Recon of Eastlake. If you’re wondering about the 2018 finalist that has captured the most Fast Track 50 awards overall, that distinction is actually shared by two businesses. ‘s 26-year history. Two other finalists in 2018, Neothink of Willoughby and NMS Inc. & Affiliates of Chardon, each will collect their 17th Fast Track 50 award at the Nov. 7 event. When it comes to the number of 2018 Fast Track 50 winners by county, Lake trounces Geauga by a 39-11 margin. Coincidentally, that’s the exact same breakdown of winners by county for the 2017 FT50. A look at winners by county over the past two years for Fast Track 50 shows that the business awards event is familiar territory for many of them. In fact, 28 of this year’s 39 Lake County-based Fast Track 50 winners also appeared on the 2017 FT50. As for Geauga County’s Fast Track 50 finalists, nine of the 11 2018 winners also clinched FT50 honors last year. The two 2017 winners that dropped off the list were Great Lakes Outdoor Supply Inc., which is based in Middlefield; and Lowe’s Greenhouses, Florist and Gift Shop of Bainbridge Township. Replacing Great Lakes and Lowe’s this year are Company 119, a Chardon-based Internet marketing and website design firm; and Millstone Management Group, a commercial contractor. While Millstone is a Fast Track 50 newcomer, Company 119 is hardly a stranger to the event, having being named as the No. 1 Emerging Company in 2014 and 2016. The Lake-Geauga Fast Track 50 is sponsored by the Benjamin F. Edwards & Co. office in Mentor; Gino’s Awards; The News-Herald; Lakeland Community College; Skoda Minotti CPAs, Business and Financial Advisors; ErieBank; Small Business Capital Corp. of Ohio; and the Lake County Ohio Port and Economic Development Authority. For more information on the Fast Track 50, contact Sheila Bare of Lakeland Community College at 440-525-7348 or Sbare1@lakelandcc.edu.